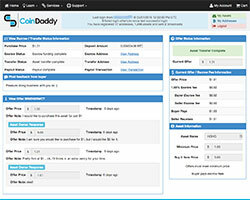 CoinDaddy - Who's your Daddy? Hearing about blockchain and crypto stuff all the time but not sure what it is all about? Want to learn more? We've got you covered! You can watch quick explainer videos in our 'Learn' section to learn how crypto can make your life easier today. Ready to get started? Thats great! The first step is to Signup for an account and verify your email address. 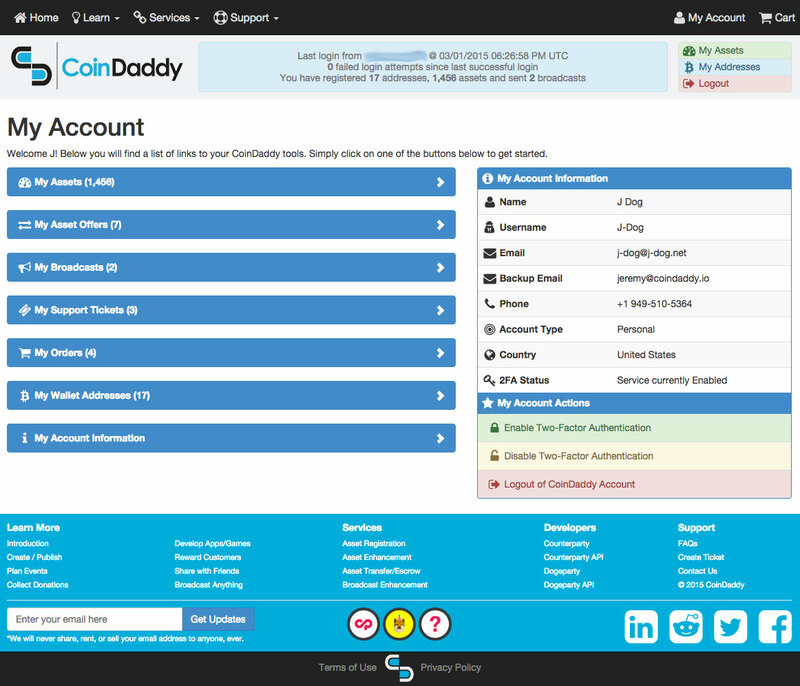 You can then register an asset or add any wallet addresses to your account to have your assets automatically added to your CoinDaddy account. Do you want to register an asset for a project, or create cool coin to share among friends? 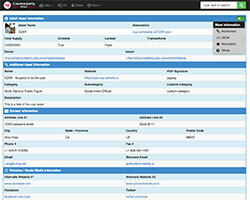 Simply create an asset using our easy asset registration service. We will handle registering the asset for you, and within minutes, it will be delivered to your wallet! Do want to sell ownership of an asset? Perhaps you want to buy an asset that someone already owns? We offer anonymous communications between buyers and sellers to negotiate a price, and an escrow service to hold funds until the transfer is completed! Have a cool asset and want to get the word out about your idea, project, or cryptocurrency? Simply verify your ownership of the asset via our proof-of-ownership system, pay a small service fee, and we setup and host a website for you at a custom url at coinsite.io! 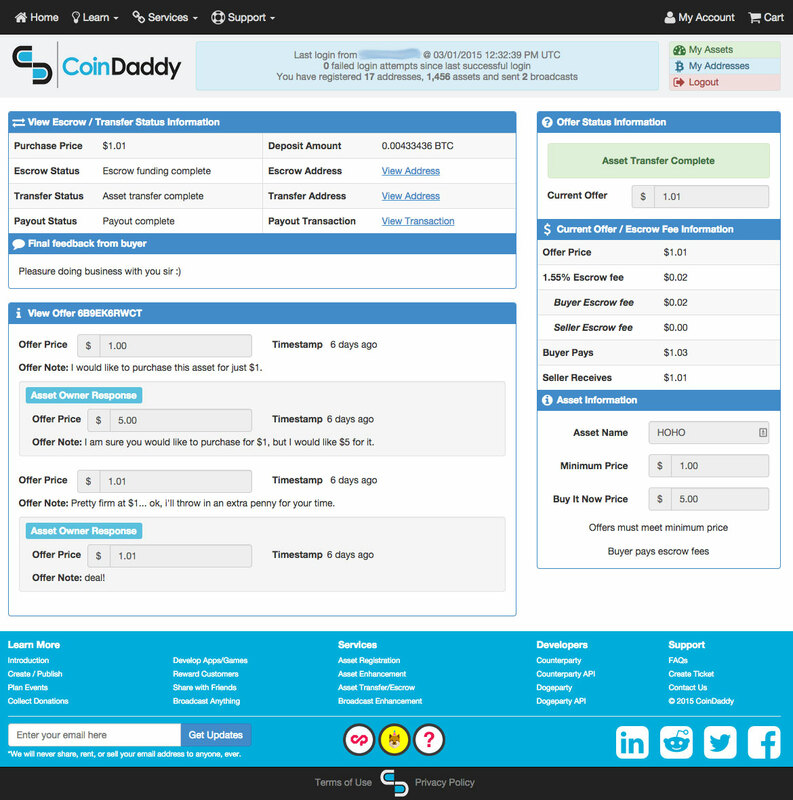 "Coindaddy is an incredible project that is helping to solve the needs of various problems in the Counterparty community. 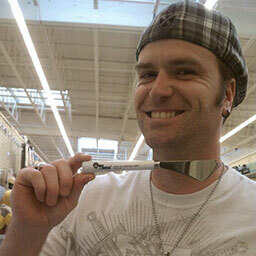 And the thing that makes the project even better is the man behind it, J-Dog. His dedication to the project and his reputation of getting things done for the counterparty community is crucial in these early days." "I appreciate the great job that Coindaddy.io is doing. It was quick and easy to register OCTO and all of my other assets. 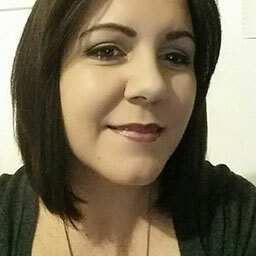 I love the escrow/transfer tool that I can use to post my assets for sale. And I absolutely cannot wait for the Reputation System to launch! 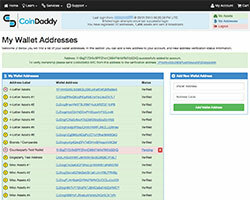 Thanks Coindaddy :)"
"After trying out coindaddy.io services and enhancing our asset we couldn't be more pleased. Our asset SCARAB now has a good home where anyone can come to find information about what our asset is and what it can do for them. All the blockchain information is transparent so you don't have to take our word for how many tokens were created and you can find all this in one place." "I'm a big believer in cryptocurrency and blockchain technologies but they are usually pretty tough to interface with. 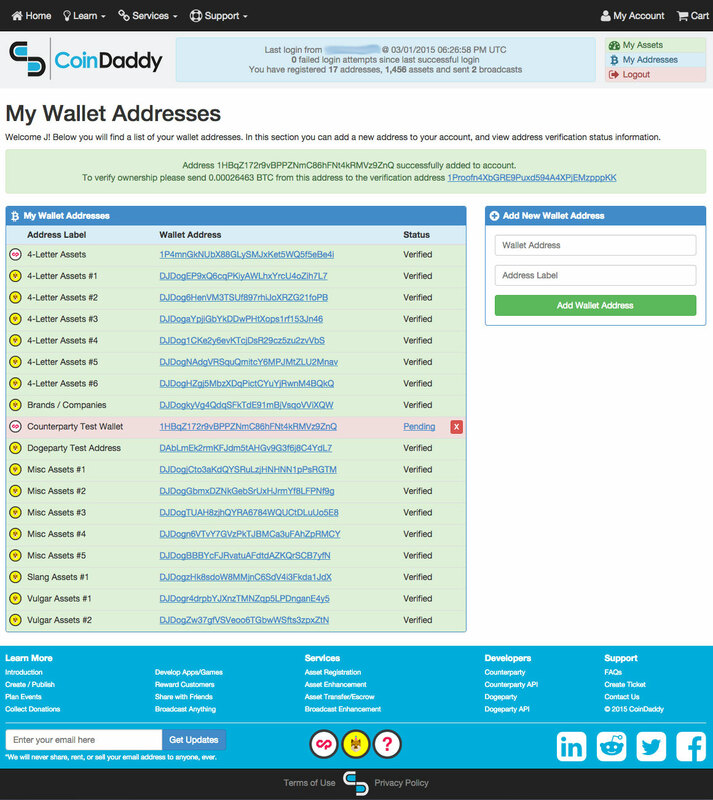 Using the asset registration tools at CoinDaddy I have been able to easily register assets on both the Counterparty and Dogeparty networks from a single website. 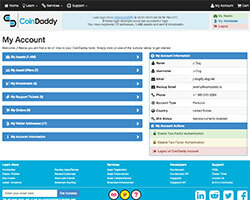 CoinDaddy has made it much easier for me to locate and register assets." "I think Counterparty is going to be big, so I reserved a bunch of assets over a year ago, but there has never been any easy way for me to list my assets for sale. Using CoinDaddy's Asset Transfer/Escrow service allowed me to list all my assets for sale, including minimum and buy-it-now prices. 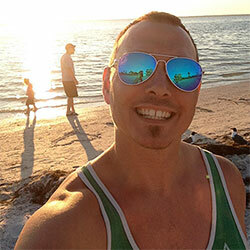 I've already sold 5 assets and the entire transfer process was incredibly easy." 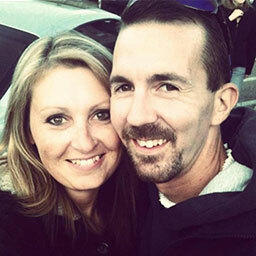 "I used CoinDaddy to register an asset which I use to motivate my husband and kids to do chores around the house. 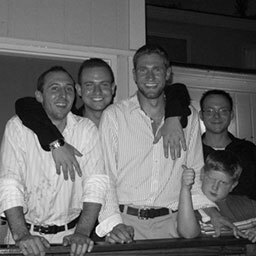 My house is so much cleaner, my kids are saving up their coins for a trip to disneyland, and my husband is saving up for a boys weekend in vegas. Best of all my entire family is now up to speed with this new technology. Thanks CoinDaddy!" 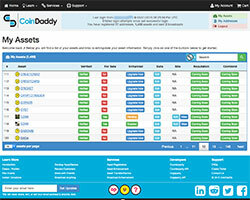 Your CoinDaddy account allows you to manage all your assets and broadcasts in simple manner. Users are able to easily add Counterparty and Dogeparty wallet addresses to their account and verify ownership with a small proof-of-ownership deposit. 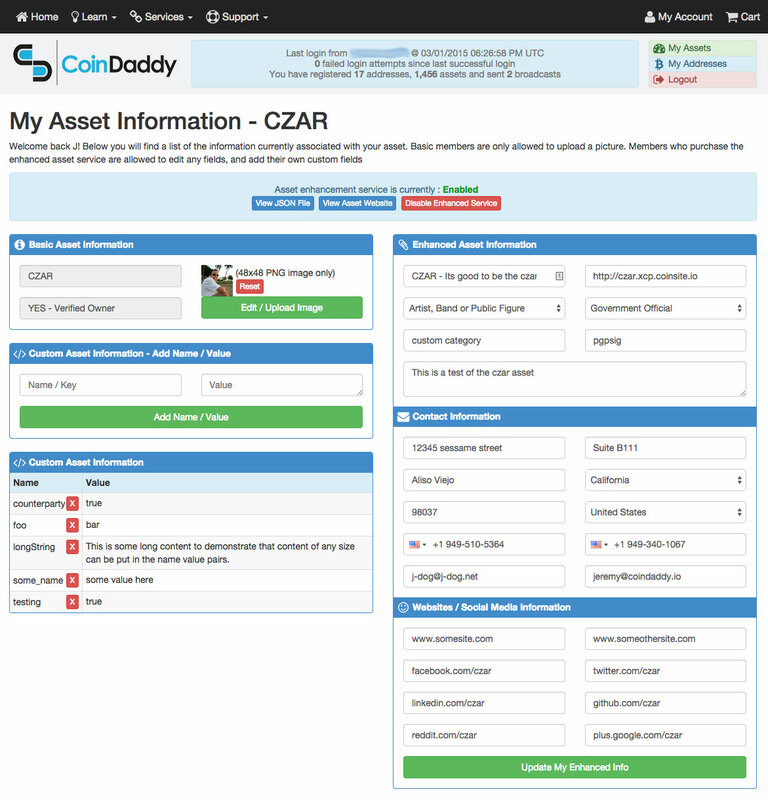 Once asset ownership is verified, assets are added to users CoinDaddy account and can easily be managed from a single location. 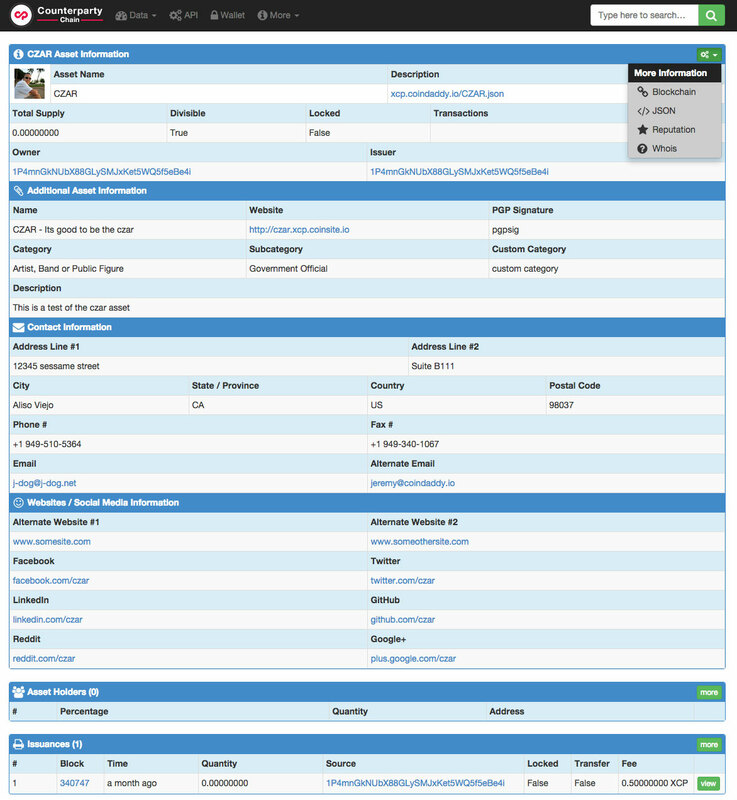 Users are able to add additional information about their asset at any point, including uploading an asset icon, contact information, custom name-value pairs, and more. 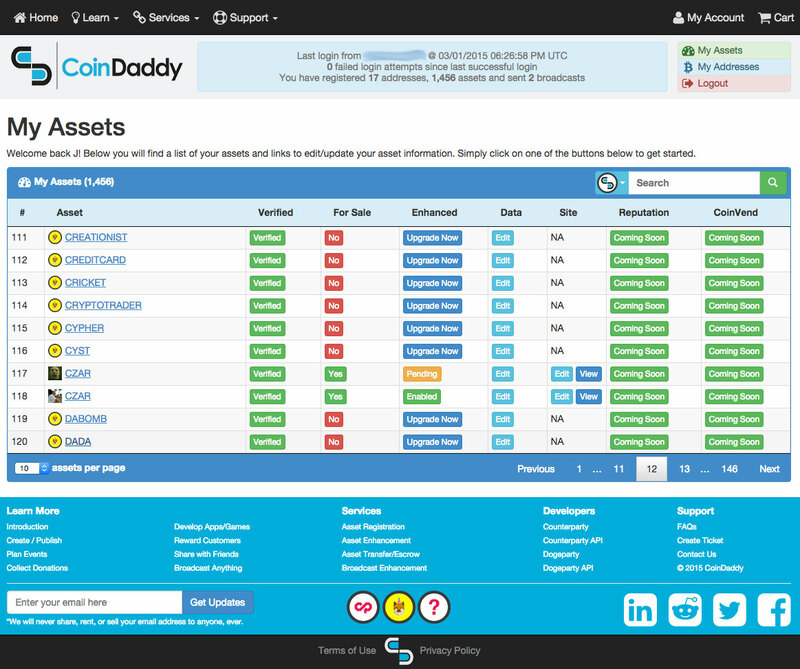 Additional asset information is visible directly on the CoinDaddy blockchain viewer sites, making it much easier for asset owners to associate their asset with their website, company, or project. Asset owners are able to list their asset for sale and negotiate anonymously with potential buyers. 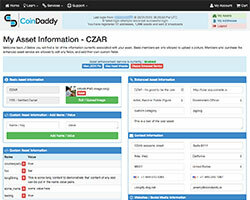 Once price is agreed on escrow account is funded and CoinDaddy secures the funds until the asset transfer is complete.